The CFC 912 and CFC 823 Filtration Rigs, currently being used by the Submarine Fleet of the U.S. Navy, were designed to eliminate contamination in High Pressure filtration systems and reduce the downtime and hazardous waste expense associated with current methods of filtration system cleansing. Whether you need to eliminate seawater mixed with your fluid or the particulate matter that has accumulated in your hydraulic systems, the CFC Filtration Rigs are up to the task. HANDTRUCK DESIGNED TO FIT THROUGH A 24" HATCH. AT LAST, A FILTRATION CART WITH IT'S OWN 24 VOLT POWER SUPPLY THAT WILL ALLOW YOU TO TRANSFER AND CONDITION PETROLEUM-BASED FLUIDS AT THE WORKSITE. THE AFC-753, CURRENTLY BEING USED IN AVIATION GROUND SUPPORT BY THE U.S. ARMY, IS DESIGNED TO REMOVE CONTAMINATION AS YOU TRANSFER FLUIDS FROM THE DRUM AND ALSO "POLISH" FLUIDS IN YOUR EXISTING SYSTEM. Introducing the new CFC200 Series Filtration Units. The CFC200 Series filtration units, currently being used in U.S. Navy dockside applications, were designed to provide a filtration System for new hydraulic fluid that does not meet the cleanliness standards required for a specified application. These units provide 1-1/2" cam lock connectors, up to 25 GPM flow, and offer three stage filtration providing the means to meet your cleanliness requirements. This CFC200 can be configured using four distinct modes. 1 - Assist helper mode - Designed to provide assistance to the output of a delivery truck or pumping system that uses a centrifugal oil delivery pump. This assistance provides a constant 25 gpm flow and pressure to allow for oil to be moved through the filters. 2 - Filter only mode - The pump / motor is not used. 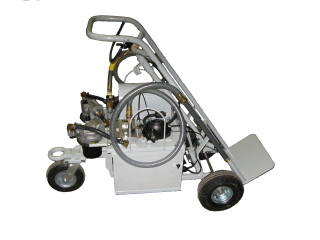 The CFC200 is designed to be connected to the output of a delivery truck or pumping system that uses a fixed displacement oil delivery pump. In this mode it functions strictly as a filter only unit. The electrical functions are not used. 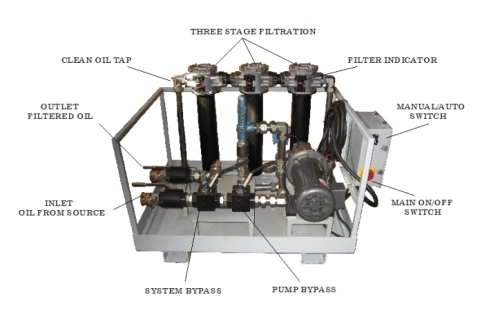 3 - Stand alone mode - Designed to transfer and filter oil from a vented supply tank using the onboard pump system. 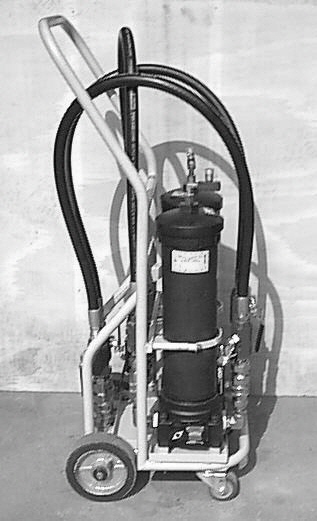 4 - Complete Bypass - Designed to allow complete bypassing of the onboard pump filter system for use as a transfer station. The Model PMP-53 Water Monitor Pack is a portable moisture sensor instrument which provides accurate measurement of the percent of saturation of moisture in your hydraulic fluids. This portable instrument allows you to quantitatively determine the moisture content, in terms of relative humidity, in your lubrication systems when working in the field. 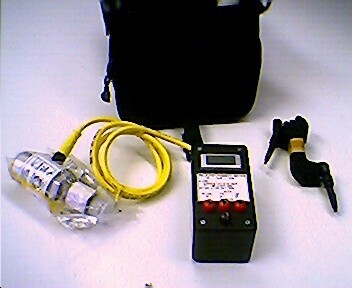 9 Volt power supply, three foot connecting cable, Tap points for reading the relative humidity in DC volts, Tap points for setting the relative humidity trip point threshold voltage, Tap points for connecting a DC volt meter used to read the MS100 voltages, and a soft carry case.